The humanitarian sector and the contexts within which humanitarian work is carried out can appear complicated and difficult to navigate if you are new to humanitarian action. However, it is critical to have a good understanding of this if you are to effectively innovate for a humanitarian purpose. In fact, if you do not adequately understand the sector, you can end up by causing real harm, when you are trying to help. Material relief assistance and services (shelter, water, medicines etc). Emergency food aid (short-term distribution and supplementary feeding programmes). Reconstruction relief and rehabilitation (repairing pre-existing infrastructure as opposed to longer-term activities designed to improve the level of infrastructure). Disaster prevention and preparedness (disaster risk reduction, early warning systems, contingency stocks and planning). Throughout this section we use a framework called the Humanitarian Parameters Box to help you navigate through the basics of the humanitarian sector and the contexts within which humanitarian work takes place. 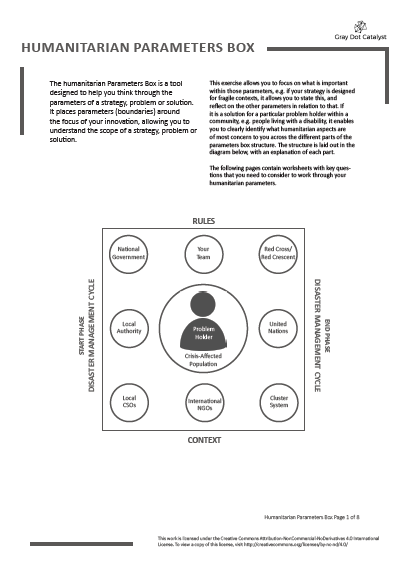 Not only does this framework help you to understand the humanitarian sector and emergency contexts, it will also help you put parameters around the problem you are trying to address through innovation. You can do this by using the tool below. Where does the problem begin? Where does it end? For whom does it matter? Where does it seem to occur? How important is this problem to those who face it? How complex and multi-faceted is this situation? You will not be able to answer all of these questions with certainty; however, posing them – at the beginning of your journey – is crucial to ensure success. To figure this out, we recommend carrying out Gray Dot Catalyst’s Humanitarian Parameters Box exercise.